When Will I Get a New Home? My best friend Z is moving into a new home...again! It seems that it was just last year we were emailing each other about her new home and the budget she was allocating for renovation and decoration etc. And now she is moving into yet another new home WOW! Talk about having it all right? So she's currently busy doing her budget, shopping for mail boxes online; all the while trying her best to minimize expenses wherever possible. It sounds fun but I know it can get costly too. Before I forget, I promised to feature some nice new mailboxes for her here. I found some awesome selections online and if she can't find them locally, they could at least give her an idea of what designs to consider when she does the actual mailbox shopping. 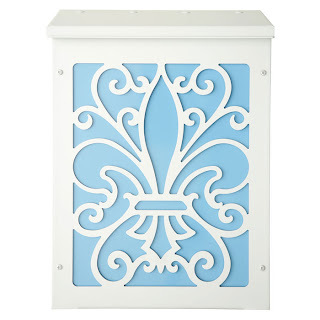 I kind of like this Blink Shadowbox Fleur de Lis Vertical Wall Mount Mailbox simply because the design is so pretty! Plus it comes in so many different colours including green, bronze, white and even black! So if you're in the market for a new mailbox as well, be it Residential Mailboxes or Commercial Mailboxes, do check out the link. With over 2500 mailbox and curbside decor products, this is the only site you need to visit when it comes to purchasing the most unique, well-designed mailboxes today! All this talk about moving and buying new mailboxes makes me feel like moving too! I wish I could move into a new home but first B and I would have to sell our current home. According to the agent who recently contacted us, now is not a good time to sell our home simply because the current market price we'd fetch for our home would not do justice to the amount we've been paying monthly. Plus, it could take almost a year before actually securing a buyer so we'll see. For now it's still condo-living for me unless if by some unexpected luck or miracle, I get a huge windfall or win the lottery! Then, you'd definitely be the first to read about my new home! I want a new home too!!! I love those mailboxed by the way.. but bukan your friend Z yang last time tinggal a few floors below/above you ke? she moved again??? wuaaahhh!! Who knows, Marzie.. you might not even have to sell your home to buy a new one.. maybe you'll be very OKB then you can rent out ur current place and get a new place!!! WOOOOT!!! I want a new home too! I want to live in a condo! hahahahaha who knows probably we'll get crazy rich blogging. LMAO!! Raining all day Shemah, gelap-gelita kat luar sekarang! Oooooooh that would be the ultimate kan? I wanna be rich like JC! Come to me $$$$$$$! australi vakasi ni pun kena suruh put on hold. my mom not feeling well ni..
brothers ask us to go back.. i'm going back kk next week i think. I got no yard ladies! My kids oso wan to play in a yard! to the pool.. and the playground. how nice to be OKB, eh marzie!! :) :) Maybe 2010 is our year!! LOL! run around in the garden.. Very nice indeed Shemah, I wonder how it feels to be OKB without a care in da world… Kamon 2010!!!! health permits her to go or not.. have to see first..
convenient here. got carrefour downstairs somemore. Yeah la takkan I wan to take Pheebs for a walk, dah la hari tu nak beli stroller for her hahahaha and then actually cannot have Pets it seems…. So I cannot be happily exposing Pheebs to da public hahahaha! I don think I’ve ever tried cili padi from KK, pedas gils is it? Wah! hot. That's why we have our supply shipped in from KK!! LOL! hahahahaa.. but i can imagine how cute pheebs will be in a stroller!! LOL! Sure la cute gils nanti ada org nak cat-nap Pheebs, better not show her off like dat lol! Fuyooooooooo how to get 600k….. fuyooooo…..
Hey GK, you have the same condo project like me lounging away abandoned too ... Imagine the amount of lepak sessions we could be having if that place ever gets built! U mean lottery??? Ask R lol, he knows or not u think? R knows toto only coz easy mah just choose 4 digits only hahahahha!! my uncle bought toto 6D last time and he won 1.2 million!!!! yeah instant millionaire! $$$$$$$ lucky him!! Fuyooooo so did he give u a cash pressie when he won?? yeah he gave us ang pows hehe!! Wah at least u got to feel some of the million RM win, lucky la! Urmmm, don't forget my red kanchil ... LOL! Recent blog:=- My Brother, The Savior! how come my name appeared as guest again? arrrrggghhh! Sometimes it does that Ayie, I have no idea why…. Not sure if u have to log in again? Woo hoo, thanks Ayie, me too no likey conventional mail boxes lol! The new ones in the market are so pretty!